In partnership with Comcast from Discovery Education, this newest partnership is geared to students, teachers, and parents in Indiana, to provide great resources for this state. Available for Comcast subscribers, this service provides a web-based, online, on-demand library of DE resources of local, national, and global issues with high quality content we have come to expect from DE. Absolutely fantastic idea, meeting students where they are already. 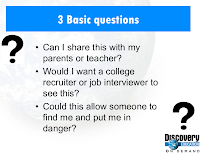 Commercial concluded, what this webinar is exploring is the need to create an appropriate and safe trail of information as students use Web 2.0 tools, social networking sites, and the Internet. The information trail that students leave behind as they explore Web 2.0 and the Internet at large is significantly different than most adults, largely because of the technology gap between then and now, or us and them. How students apply for college or a job today is so much different. Years ago, you had tighter control for marketing yourself. People saw what you wanted them to see. But today, your social media profile represents you, and what you may think is private to friends, family, and groups actually represents public information to several millions of people. Steve says that this presentation came out of getting into an altercation that landed him in the principal’s office with a message that his next infraction would land on his permanent record. While this kind of record does not really exist today, what does exist is the trail we leave. 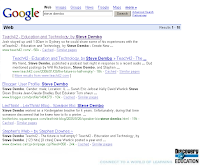 Everything you search becomes a part of your history, your permanent record of websites visited. Social sites are not bad per se; what is bad is when someone does something questionable and does not realize how bad or permanent it can be. And as deliberate as your control of your flow of information may be, things can escape you. If you put something out there, it will likely pop up where you do not expect to see it. People can be expelled from college, fired from the workplace, or removed from office for their digital dossier. We are on disconnect with the notion of knowing what is private and what is public. Parents are often most vulnerable; they think they are not a subset of the real world. Sharing with a specific group does not mean that information is truly private. Be careful of your images and your captions; you may not be employable at a job of your choice. Your online work needs to remain professional, and you need to understand whatever you post online is truly public to the determined searcher. Steve reminds us that blocking access to websites does not teach acceptable use. Our students are used to instant gratification, on-demand access to information. 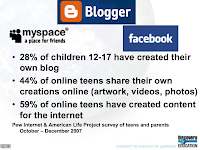 After all, they are our grown digital natives who begin creating Facebooks and websites in elementary school. The solution: Discovery Education resources with vetted content that is not blocked. Multitaskers here you go with the vast variety of DE content with out-of-the-box content. What we need is to meet our students where they are, and teach appropriate use. Profiles are not anonymous; neither are emails. Just when students think their content is safe and private, they find out it really isn’t. Once something is online, privacy is just a matter of determination. Anything is accessible, and delete does not mean gone. And another difference we encounter, even with digital technology is between Web 1.0 and Web 2.0. Creating content interactively and collaboratively is the essence of Web 2.0; it’s how students play and want to learn. Schools need to create policies and protocols and help students take steps to understand what appropriate use really is. Filters exist because the laws has changed from “appropriate use” to “internet safety,” making anything objectionable or harmful to local school districts to interpret what is not appropriate. Be proactive. Learn how social networking sites work. You can choose to add students or not. Model appropriate use and show them how to represent themselves professionally. Show students their work is not that private. Deleted does not mean gone. The big question: where will students be in 10 years? The job market to a middle school students will still be there; will their questionable YouTube video hurt them? You need to change the content at their source; blanket it with newer more relevant content. If you know colleges and businesses are searching, you need to provide positive and relevant content, and it doesn’t take much to provide good content for them to find. Demonstrate your passion, the things you are into, but do it positively. If you feel that you cannot share what you are doing with your parents, superintendent, then don’t put it on the net. Clean house regularly; you will forget 2 years from now what you wrote back then. There are definitely safe classroom alternatives. 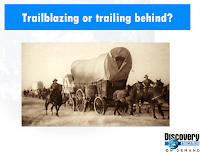 We need to trailblaze with our students, not trail behind them. Students are doing things now, so we need to act now, and find ways to make the shift work for teachers. Have students create their social resume. The real world begins right now, but if not sooner, it certainly begins in middle school. Choose the pieces you want to use to represent yourself; most colleges and employers do a 3 page Google search. Employers today draw from their own; people who are passionate about the same things–online. Work deliberately and maintain tight control over your content. Steve reminds us that parents and/or teachers discussing things with their students is not an invasion of privacy; what’s out there is about as public as it gets. Take control of your permanent record.